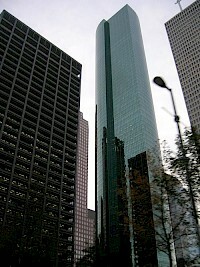 One Shell Plaza (OSP) is a 50 floor skyscraper at 910 Louisiana Street in Downtown Houston, Texas, United States. At its completion in 1971, One Shell Plaza was the tallest building in Houston, Texas, standing 715 feet (218 m) tall. Including the antenna tower on its top, the height is 985 feet (300.2 m). One Shell Plaza was designed by Skidmore, Owings & Merrill LLP. Associate architects of One Shell Plaza were Wilson, Morris, Crain & Anderson. Phoenix Tower is a 434ft (132m) tall skyscraper in Houston, Texas. It was completed in 1984 and has 34 floors. 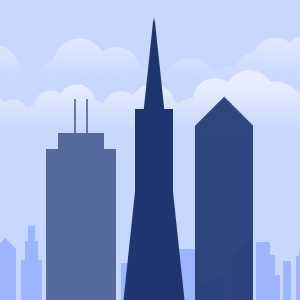 It is the 36th tallest building in the city. It is managed by Hines Interests. The Phoenix Tower is adjacent to Greenway Plaza and located in an area between Downtown Houston and Uptown. In 1983 Hurricane Alicia blew large chunks of concrete and steel from the under-construction parking deck onto the Buffalo Speedway. Reliant Energy Plaza is a 518 ft (158m) tall skyscraper in Downtown Houston, Texas. It has the headquarters of Reliant Energy. The building has around 800,000 square feet (74,000 m) of space. 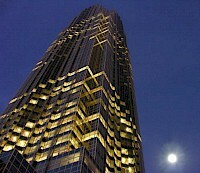 It was constructed from 2001 to 2003 and has 36 floors. It is the 25th tallest building in Houston. It is made out of glass, steel, and concrete. Lights atop the building and on the main street side flash in patterns of various colors at night. 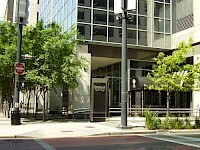 The Texas Company Annex is a building in downtown Houston. It was a building for Texas Company, better know as Texaco. 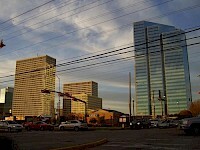 The Huntingdon is a 503ft (153m) tall skyscraper in Houston, Texas. It was completed in 1984 and has 34 floors. It is the 27th tallest building in the city. It is also the tallest all residential building in the city and was the tallest all residential building in Texas until the Mercantile Building was converted into residential, whose spire is twenty feet taller. It includes baroque gate piers. The Huntington is within the Houston Independent School District. The Mercer West Tower is a 30-story, 401 ft (122 m) high-rise condominium building located on Sage Street in the uptown district of Houston, Texas, United States. 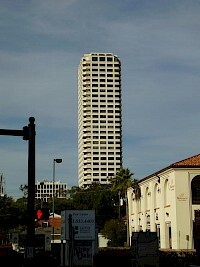 The building is the first of two towers that are part of the Mercer Towers complex. The tower is the 45th tallest building in the city. The Mercer West Tower opened in 2003, after being constructed in less than one year. The Spires is a 426-ft. (130m) tall skyscraper in Houston, Texas. It was completed in 1983 and has 40 floors, making it the 39th tallest building in the city. It is the tallest and most prominent building in Hermann Park, and is visible from the southeast throughout the Houston Zoo. Three Allen Center is a 685-foot (209 m) tall skyscraper in Houston, Texas. It was completed in 1983 and has 50 floors. It is the 12th-tallest building in the city. The Class A office building is owned by Brookfield Properties and sits on top of Houstons six-mile (10 km) pedestrian and retail tunnel system. It also includes a 350 room Double Tree Hotel. The Williams Tower (formerly the Transco Tower) is a skyscraper located in the Uptown District of Houston, Texas. It was designed by architects Philip Johnson and John Burgee, in association with Houston-based Morris-Aubry Architects, and erected in 1983. The tower is among Houston's most visible buildings. The building is the 4th-tallest in Texas, the 22nd-tallest in the United States, and the 80th-tallest building in the world.